Prime Minister David Cameron has been called upon to act to address the scandal of people with mental health problems sleeping rough, as new statistics show a significant increase in the numbers of people living on the streets. Government figures show the amount of people sleeping rough has increased by 30% – up from 2,744 in 2014 to 3,569 last year. Homelessness charity St Mungo’s has also produced research, which shows that the number of people rough sleeping with a mental health problem is also rising and that 61% of staff working in homelessness services say rough sleepers can’t access the mental health services they need. St Mungo’s report, Stop the Scandal: An investigation into mental health and rough sleeping, found that 4 in 10 rough sleepers have a mental health problem, rising to more than half of rough sleepers from the UK. 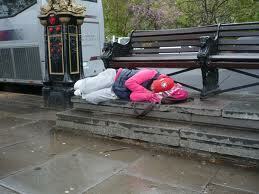 In addition, rough sleepers with a mental health problem end up on the streets for longer. For the research St Mungo’s surveyed 225 street outreach staff across all English regions about rough sleeping and mental health problems. The survey also found that 78% of respondents said that in the last 12 months they had met at least one person sleeping rough who had recently been discharged from a mental health hospital. In addition, 44% of respondents said that the number of people who sleep rough soon after being discharged from a mental health inpatient service is increasing; only 7% said it was decreasing. The charity is asking people to sign an open letter to the Prime Minister urging him to build on his previous commitments to tackle rough sleeping and enhance mental health services for all those in need. Howard Sinclair, chief executive of St Mungo’s, said: “Few would disagree that it’s nothing short of a scandal that people with mental health problems are sleeping rough. Not only that, but this incredibly vulnerable group are more likely to remain in dangerous and unhealthy situations for longer. The very real concern is both the shocking, unprecedented rise in people who are sleeping rough, and evidence that more of this group are struggling with poor mental health. “We are asking the Prime Minister to lead a new, ambitious national rough sleeping strategy which ensures that government departments and the NHS work together. It must deliver mental health assessments and professional support to people on the street, specialist supported housing to help their recovery, and the right support so people don’t end up sleeping rough after leaving mental health hospitals.